SPECIAL FUNCTIONS: External USB charging port with set-in charging cable is convenient for your electronic device’s use anywhere. MULTIPLE COMPARTMENTS: A total of 6 pockets – 1 roomy main compartment for books,1 laptop pocket, 1 front zipper pockets to hold valuable items, 1 pencil case for pencil and 2 side pockets for water bottle or umbrellas. 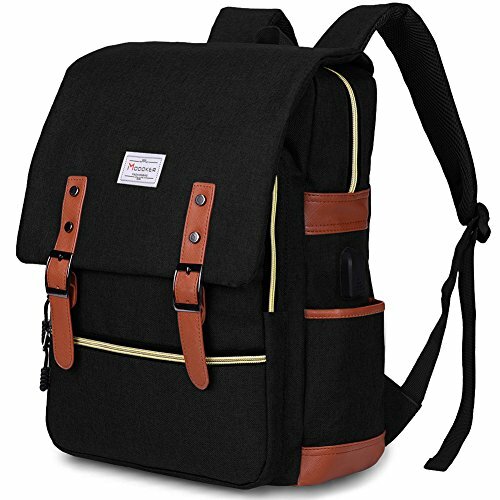 DURABLE FEBRIC: Durable backpack exterior is made from high quality lightweight 600D polyester material and soft inner materials.